No one will argue that men are quite different from women. Men often see the world and react to life’s circumstances differently, and even have dissimilar perspectives than women when it comes to maintaining their health. From what I’ve heard and observed, women are more likely than men to go to the doctor for yearly physicals and have their blood pressure and cholesterol checked. Women tend to visit the doctor more often because they’re more likely to go when they’re sick, and they get annual gynecological exams and mammograms plus prenatal care when they become pregnant. And since women are more inclined to assume the role of caregiver for their families, they make the doctor appointments for their children and sometimes even their husbands. However, not all men neglect their health. Many eat healthfully, exercise regularly, and get annual checkups, but those who don’t run the high risk of developing chronic diseases. According to the Centers for Disease Control and Prevention, heart disease is a leading cause of death for men. Various types of cancers, such as prostate, lung, and colorectal, run a close second, followed by stroke and type 2 diabetes. Black men have higher rates of heart disease, prostate cancer, and type 2 diabetes than whites, and are more likely to die and develop complications from these diseases. While there are many reasons for these health disparities, the bottom line is that men need to take better care of themselves—and this is where nutrition professionals can help. 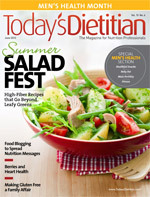 In honor of Men’s Health Month, Today’s Dietitian is featuring a special section devoted to men’s health and nutrition. The articles provide strategies on how to counsel male clients and patients about obesity, healthful eating, fertility, and fitness. We give you tips on how to effectively communicate your nutrition messages to men and motivate them to make the necessary changes to improve their health. There’s also a Men’s Health News department and a guest editor’s note from editorial director Jim Knaub, who introduces the section from a man’s perspective. After reading this special section, give us your feedback on our Facebook and Twitter pages. And please enjoy the rest of the issue!